What Can One Say about the 616 PAC? It’s hard to know what to say about the 616 PAC. Bill Jackson who runs it seems remarkably lackadaisical about following the law. My complaint, evidenced in earlier posts, is still outstanding. I’ve talked with the Michigan Department of Elections staff, who inform me that he simply doesn’t respond to their requests. Meanwhile, he also doesn’t believe in filing the necessary reports. Recently he received a second notice with a $250 penalty for failing to file timely reports. The whole electronic paper trail is available on the state Department of Elections site. I shall report on any future developments. Eight months later than originally announced, the new Grand Rapids Township website is finally up. Jan Holst has the details in a Cadence article. It is an improvement over the previous version, but so far the changes are largely cosmetic. For example, the agendas and minutes are still so lacking in detail as to be useless. Take a look at the website for neighboring Cascade Township. The full documents township boards and commissions will consider are available on-line before the meetings. I hope that once the Grand Rapids Township staff gets used to the new site, they will take the simple steps that will help citizens know what is going on. I got rather soundly trounced in August primary for Grand Rapids Township trustee. The four incumbents were supported by the 616 PAC, a political action committee that is rather loose in meeting the requirements of the Michigan Campaign Finance Law. PACs are required to file financial reports. The material for the 616 PAC is available here. Although the PAC spent significant sums to elect the seven incumbents, the original required July and October financial statements showed no contributions and no expenditures, a rather surprising situation. 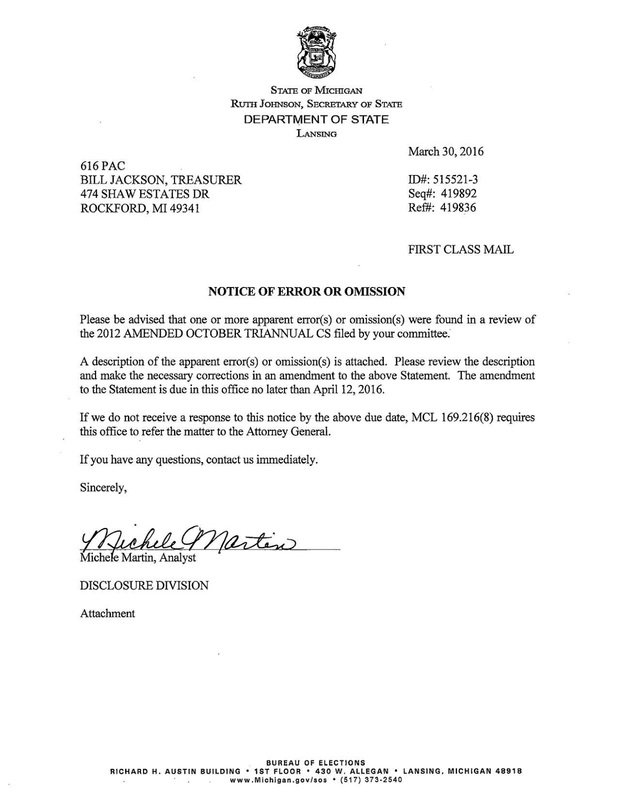 I asked the 616 PAC treasurer Bill Jackson for an explanation. He never replied, but some weeks later amended statements were filed showing both significant contributions and expenses. These are available on the Secretary of State website linked to above. 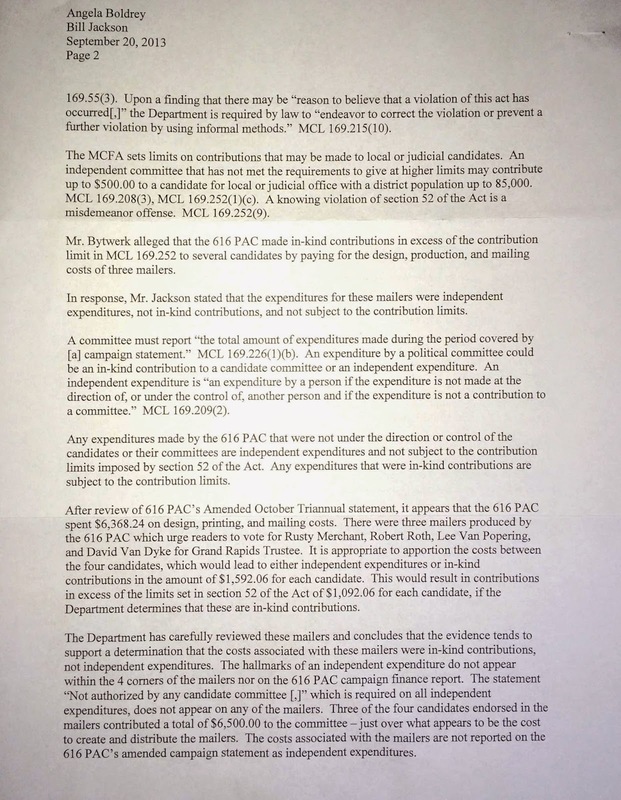 The reports show that all but one of the existing trustees contributed to fund their re-election, a quite reasonable thing to do assuming they are supporting a PAC that follows the law. Trustees David VanDyke and Robert Roth each contributed $3,000 to the 616 PAC. Lee VanPopering and Michael DeVries gave $500. Chris Afendoulis and Edward Robinette (whose name is misspelled in the report) gave $250. 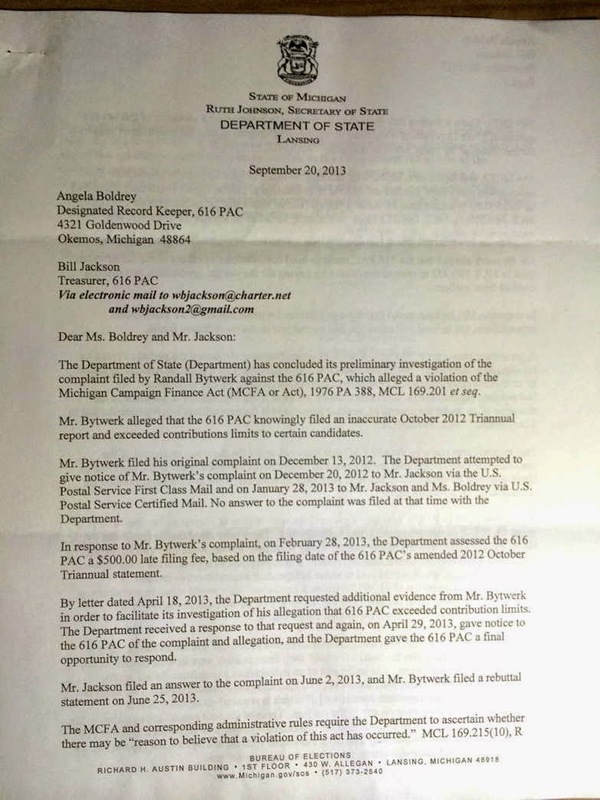 Rusty Merchant is the only trustee who apparently did not contribute. If I understand the Michigan campaign finance law correctly (and I may be wrong), the 616 PAC was limited to $2000 to support the four incumbents. It spent $7500. 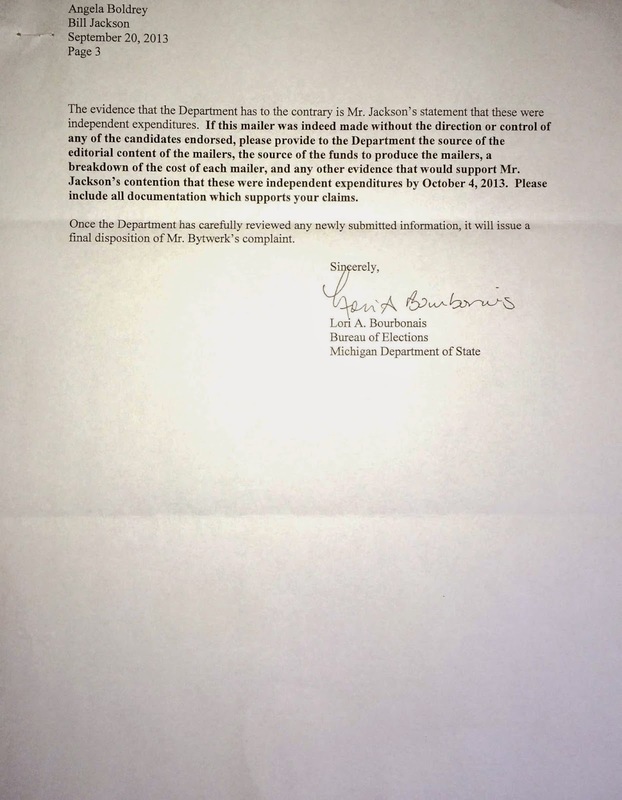 I’ve asked for more details, which I will post here if I get them, but it looks to me as if the 616 PAC violated Michigan law in financing the campaign to re-elect the incumbent trustees.